Crikey, I'll be spoiling you all today you know. This is going to be the first of 2 posts! Almost unheard of for me! I'm more of a 'pace yourself' kinda gal! Anyway, the first post today is to share my Copic Colour Challenge DT card with you. I really enjoyed playing with this weeks colours C3, R11 and G21. Such a pretty little combo and pretty easy to work with, which is always nice! We're also sponsored by InStyle, which would explain this super cute image....! I'm totally getting in to my soft and springy colours again. It is so nice to get back to this, especially after the chilly winter we've had! I also used the layout over at Friday Sketchers this week - fab sketch, huh? 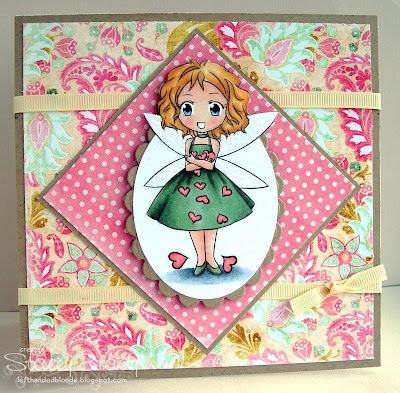 Paper: One of my many Zoe Pearn sets from Sweet Shoppe Designs! Copic Markers: E00, E11, E50, Y17, Y21, YR23, R20, R22, G21, G85, G99, C1, C3, C5, C7, BG01, BG05. Tools & Embellishments: Nesties, glitter and ribbon from stash. Make sure you pop back later - I'm in the Whimsy Magical Mythical blog hop! Oh, so beautiful!!! Such a gorgeous image - perfectly coloured!! Stacey, this is gorgeous and I so love these colours. I see that we both used the same sketch this week, just as well that we used different images!! Stacey-LOVE your coloring! and that image is just so cute! What a gorgeous card Stacey. Oh she is so cute and love those springy papers. Absolutely gorgeous card Stacey...love the sweet image and your beautiful colouring. Awesome card! I really love how you played up the shadows in your coloring. The contrast is spectacular.